Coming into the weekend, there were 9 undefeated teams in NCAA Division I women’s volleyball. Coming out, there could be no more than 8, because two of the teams on the list, Purdue and Alabama, were scheduled to play at the Crimson-White Tournament. But the big undefeated showdown almost wasn’t. 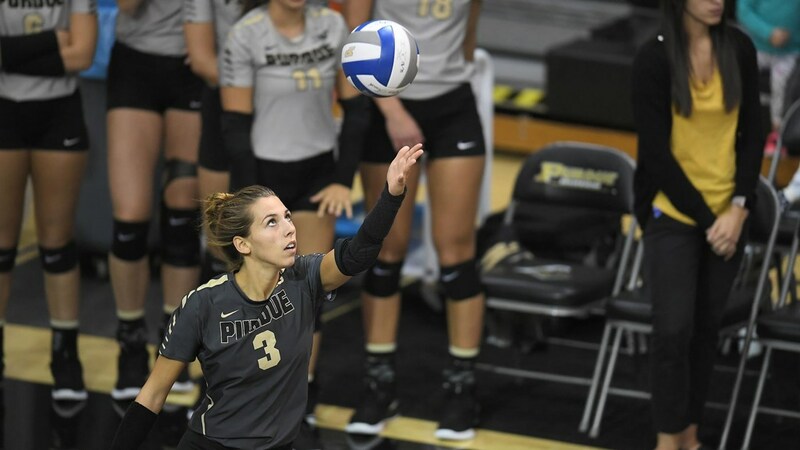 It took Purdue 5 sets to beat Southern Miss earlier in the day, but they eventually prevailed in a 21-19 marathon tie-breaker, part of a match that had 3 sets go to extra points. Even with a 6-5 Southern Miss team, that match far out-lived the hyped matchup later in the evening, where Purdue won fairly-handily in a 3-0 sweep (25-22, 25-19, 25-15) to keep their perfect record in-tact. Purdue is now 4-0 all-time against Alabama, with wins in 1978 (2-1), 1981 (3-1) and last season (3-0). Purdue moved to 10-0 for the 5th time in program history. Their longest winning streaks to open a season: 15 in 1982, 14 in 2011, 12 in 1985, and 11 in 2005. The win over Southern Miss was the first matchup between them and Purdue in school history. The 78 attacks by Southern Miss’s Kylie Grandy is a new school record, breaking the old mark of 75 set by Tonia Hatfield in 1995 (that was in only 4 sets). The 26 kills ranks 6th in school history for most kills in a 5-set match, and is the most in the 25-point rally-scoring era. Alabama beat South Alabama 3-1, including a .560 hitting percentage in a dominant 3rd set, to beat South Alabama. Alabama is now 27-4 all-time against South Alabama. The Crimson Tide had 3 players in double-figures: Christine Jarman with 17 kills, Mahalia Swink with 13 kills, and Leah Lawrence with 11 kills, hitting .381. Quincey Gary had 31 digs for Alabama. South Alabama was led by Iva Durdanovic with 17 kills, while Kristina Albastro had 14. An early candidate for ‘most thrilling’ match of the season, Purdue eventually prevailed in a nailbiter over Southern Miss. The Boilermakers had two players with over 20 kills: Sherridan Atkinson, who had 25 kills on a whopping 72 swings, with 7 blocks and 6 digs to boot; and Blake Mohler who had 21 kills on just 33 swings (.545 efficiency), plus 8 blocks of her own. Southern Miss rode the arm of Kylie Grandy, who had 26 kills on 78 swings in the match (the 4th-highest swing count in an NCAA match this season), to go with 12 digs for a double-double. Purdue libero Brooke Peters, who had a match-high 32 digs, was nails all-match-long for Purdue. She also scored 3 service aces, including the clincher in the 5th set. This could have been a ‘trap match’ for the Boilermakers, after the emotional high of their earlier 5-set win. The first set was pretty competitive, with Purdue hitting .200 and Alabama .179; but the Boilermakers’ fortunes grew in each set. They hit .341 in the 2nd, and .452 in the 3rd, and by the end fully-overwhelmed the Crimson Tide. The stat-lines were much more subdued this time. Atkinson had 10 kills on .300 hitting, while Mohler had 9 kills and hit .467 out of the middle. Peters had 17 digs and 3 more aces for Purdue in the match. Doris Carter led Alabama with 9 kills, but hit just .179 in the match.